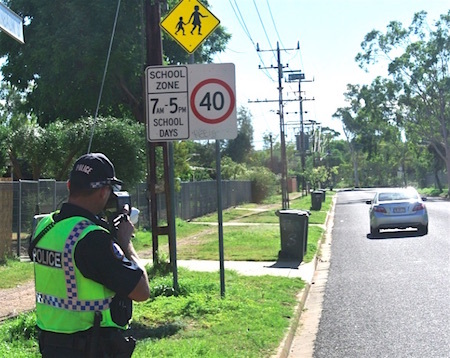 Police are “appalled” at the number of people who were speeding during a traffic operation targeting school zones this morning. Sergeant Conan Robertson says 14 traffic infringement notices were issued, with one car recorded travelling at 61 kilometres an hour in the clearly marked 40 zone. “It is up to drivers to concentrate and drive at a safe speed around school zones as children are easily distracted and may not yet understand road rules,” he says. PHOTO: Traffic cop in action near Centralian Middle School this morning. Maybe because children could get out anytime for diverse reasons i.e. medical appointments, sport activities, midday recess and even absconding. I can understand the speed restrictions at critical times but I cannot understand why the NT has a 40km/h limit in school zones when all the children should be in class. NSW has the 40km/h limit at school start and end and 50/60 km/h at other times.